Lovely, quaint and European are all terms that are used to describe Quebec City. Set in the south of Quebec, Canada’s French province, the city provides a wonderful setting for people to explore the unique French Canadian culture. With a variety of historical sites – Quebec is one of North America’s oldest cities and the only outside of Mexico with a wall in city centre– plenty of parks and shopping there is much to do for all visitors of the city. In order to provide some guidance of what to do with so many options this article will suggest a few of the best things to do in Quebec City. Place Royale is considered to be the birthplace of the French colony in Canada. In the 17th and 18th century Palace Royale acted as Quebec’s centre of business and industry while supporting a thriving marketplace and homes for the city’s wealthier citizens. Though in modern times the relics of this past have succumbed to more modern commercial offerings there still are a few reminders that show the importance of this historic section of the city including a Bust of Louis XIV and the Église Notre-Dame-des-Victoiree which is the oldest stone church in Canada. In order to connect deeper with this vibrant part of Quebec City make a stop in the Place Royale Interpretation Centre to learn more about its storied and interesting past. 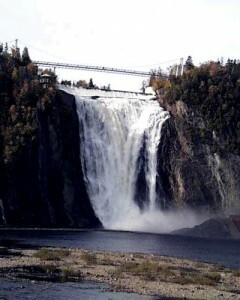 A great spot for nature lovers looking to get away from the historical charms of Quebec City is Montmorency Falls Park. The iconic centre piece of the park is its 272 foot waterfall Montmorency Falls, which actual is higher – though nowhere near as wide – as Canada’s other more famous waterfall Niagara Falls. Many visitors say that the real time to visit these falls is in the winter when the snow covered Quebec country side creates a memorable, camera friendly, aesthetic. Though it is always free to climb the stairs to viewing area of the falls from the visitor centre there is also of taking the cable car to avoid the legions of stairs. The cost of the cable car is $10 dollars Canadian. A great way to spend a few hours is in the Quartier Petit-Champlain, the oldest shopping district in North America. Though now the Quartier Petit-Champlain looks to sell souvenirs to tourists rather than fur pelts to stay warm it is still a great place for a browse of all sorts of items as well as a great place to enjoy a coffee in any one of the district’s cozy cafes. Be sure while in the Quarter to climb the famous Escalier Casse-Cou(Breakneck Stairs) in order to enjoy wonderful views over Old Quebec.